Check our compatibility guide if you want to know whether Acrolinx for AEM works with your local platforms. 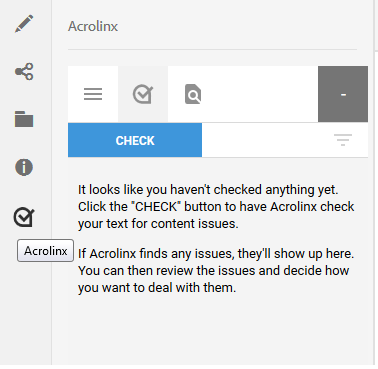 You can use Acrolinx for AEM to include content quality checks into your CMS workflow. This article covers the main steps to get you working comfortably with Acrolinx for AEM. If you're looking for help to install Acrolinx for AEM take a look at our Acrolinx for AEM Administrator Guide . To show the Sidebar, first select Acrolinx from the mode menu. Then, toggle the side panel to show or hide the Acrolinx Sidebar. To show the Sidebar, select Acrolinx from the menu. To show the Sidebar, toggle the side panel and select Acrolinx from the menu. To show the Sidebar, toggle the side panel and select Acrolinx. What can I check with the Sidebar? You can check content in the Touch UI and in the Classic UI in AEM. You can also check HTML content in Content Fragments. And we support checking in the Scaffolding view. If you use the XML Documentation Add-on for AEM , then you can also use Acrolinx for AEM to check your Assets DITA content. Acrolinx for AEM supports DITA and XML document formats. This includes the DITA doctypes; concept, reference, task, topic. 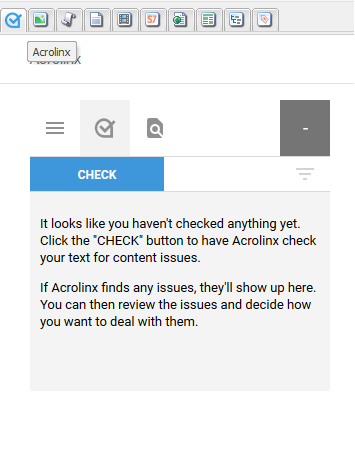 You can check your content with Acrolinx in Author mode. What does Acrolinx include in my check? 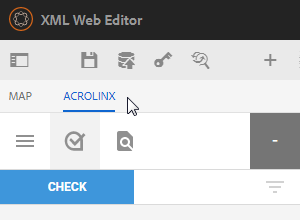 Acrolinx for AEM checks all the default AEM components that you have the option to edit but isn't always able to insert suggestions if the components aren't enabled for in place editing. Acrolinx includes checks from AEM Sites. 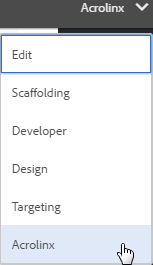 If your components are capable of in place editing, then the Acrolinx Sidebar can insert suggestions into those components. 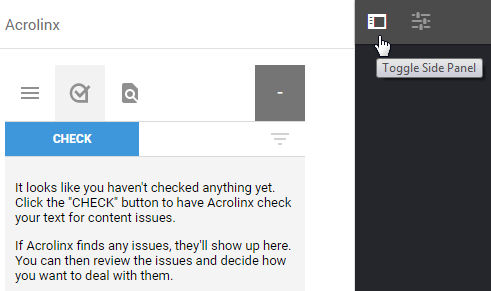 If your components aren't capable of in place editing, then Acrolinx checks your content, but can't replace the content and you get a grayed out card. We call these 'read-only' components. Here are some typical components that Acrolinx checks including components that are 'read-only'. Tip: If you have special or custom components, then we have a special tool you can use, the Acrolinx Configuration Assistant. The Acrolinx Configuration Assistant helps you configure which AEM custom components you want Acrolinx to check. And you no longer need to edit the custom components configuration file (CustomComponents.json) in CRXDE Lite. You can write, validate, and preview your configuration results all in one place. It can be a little tricky to analyze the structure of your page, so you might need some help from your administrator. Find out more in the section Define Custom Components With the Acrolinx Configuration Assistant in our Acrolinx for Adobe Experience Manager (AEM) Administrator Guide . Where can I change my Acrolinx address? Go to the article Acrolinx for Adobe Experience Manager (AEM) Administrator Guide . Navigate to the section Connect to Acrolinx .